TAYLOR Swift looks Red hot as she flashes her toned pins in a pair of skimpy denim shorts. The 23-year-old country singer gave her slender legs an airing during a photo shoot in Los Angeles yesterday. She teamed the hot pants with a pale turquoise shirt, yellow sunglasses and a pair of red trainers that matched her lipstick. Later the blonde starlet changed into a stripey sweater and black pedal pushers – and hit the trampoline. Another shot for the Esquire magazine shoot showed her cycling in a blue pleated skirt and navy knit jumper. Taylor is currently on a six month tour with British singer-songwriter Ed Sheeran, who has recently denied reports they are a couple. Ed, 22, said: “You don’t have to bang a girl just because she’s your friend. It’s not a necessity. The flame-haired Brit, who is supporting Taylor’s Red Tour of North America, embarrassingly fell over while opening the gig in Omaha, Nebraska, last week. 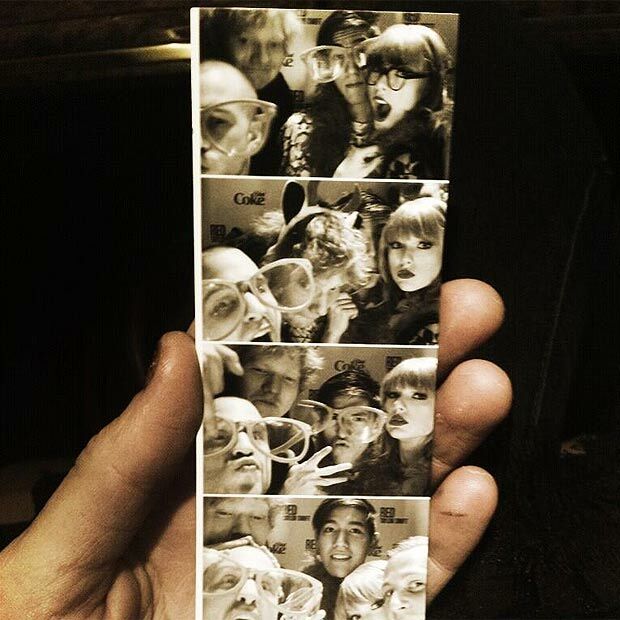 Taylor, Ed and pals Scott Myrick, Taeok Lee and Lockhart Brownlie snapped themselves fooling around backstage on Friday. Taylor uploaded the picture to her Twitter account, adding the caption: "In other news, we now have a photo booth backstage."